2018 Slovakia Anniversary Year Celebrations Continue with Events in Pittsburgh and Washington, D.C.
Left to Right: Katarina Csefalvayova, Chair of the Foreign Affairs Committee of the National Council of the Slovak Republic; Lucas Parizek, State Secretary of the Ministry of Foreign and European Affairs of the Slovak Republic; Peter Kmec, Slovak Ambassador to the U.S., ; Tod Sedgwick, former U.S. 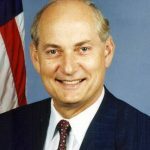 Ambassador to Slovakia; Vince Obsitnik, former U.S. 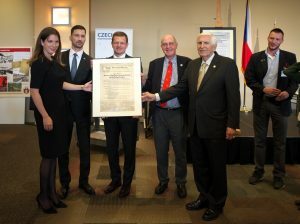 Ambassador to Slovakia, display the Pittsburgh Agreement document. During this special anniversary year of 2018, a number of events have been held, most recently in Pittsburgh and Washington, D.C., commemorating the historical events of 100 years ago. The major event, a gala reception commemorating the ‘Pittsburgh Agreement’ was held on May 31 in Pittsburgh, at the Heinz History Center. 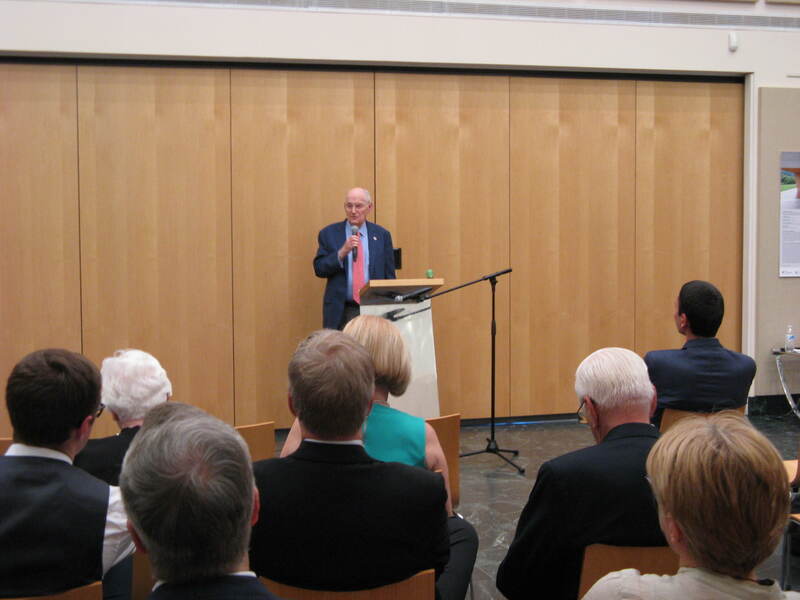 It was organized by the Slovak and Czech honorary consuls and the embassies of both countries. 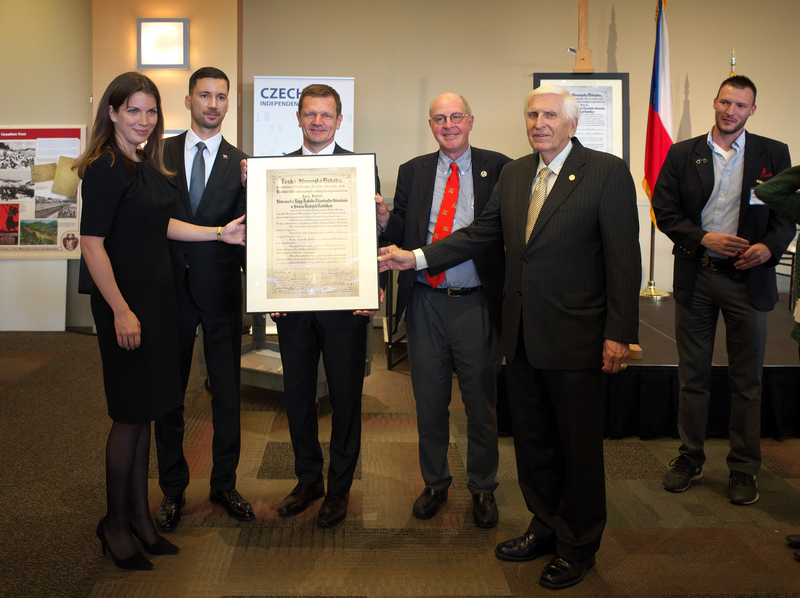 Nearly 300 attendees and guests heard from local officials and Czech and Slovak government officials commemorating and interpreting the event that took place 100 years ago in downtown Pittsburgh. There, Prof. Thomas G. Masaryk met with representatives of the Slovak-and Czech-American communities to endorse an agreement that Slovaks and Czechs would support the formation of an independent republic following the end of World War I and the dissolution of the Hapsburg Empire. From this ‘Pittsburgh Agreement’ and a number of other keys events, the nation of Czecho-Slovakia (or Czechoslovakia) emerged. The resulting nation experienced both a glorious and torturous path within Europe throughout the middle of the 20th century (1918-1992). 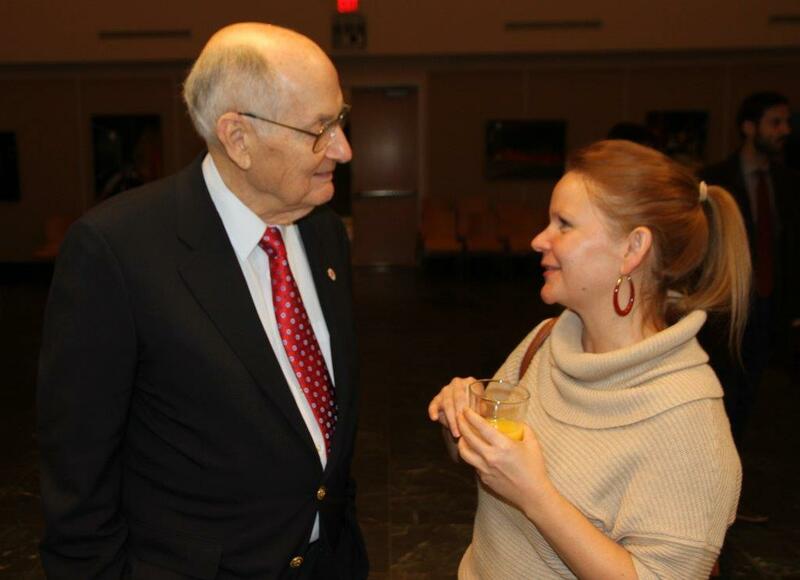 On May 4 at the Slovak Embassy, Ambassador Ted Russell (Ret.) 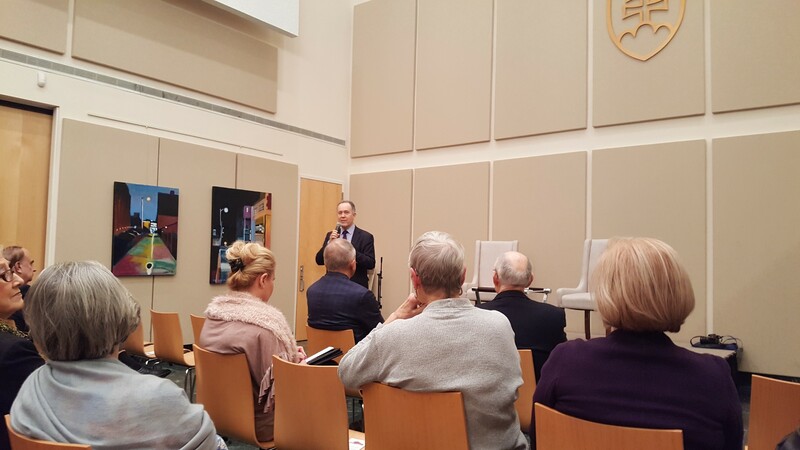 discussed his experiences as Deputy Chief of Mission in Czechoslovakia during and after the 1989 Velvet Revolution and then as the first U.S. Ambassador to Slovakia after the 1993Velvet Divorce. He described the role of U.S. diplomacy during these turning points in Czech and Slovak history and the U.S. Embassy’s interaction with Czech and Slovak leaders, including Václav Havel and Vladimír Mečiar. 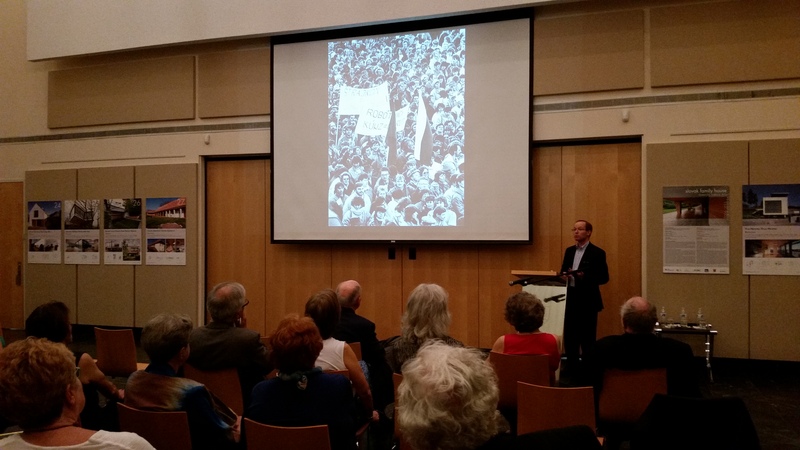 Ambassador Russell emphasized how the Communist government in Czechoslovakia, which lacked public credibility and the promise of Red Army support, simply dissolved in the face of growing, massive demonstrations beginning November 17, 1989. 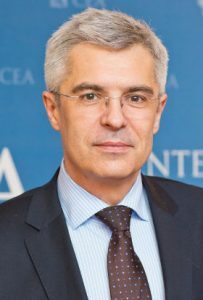 He then described the bumps in the road towards democratization during Meciar’s leadership of newly independent Slovakia after the 1993 Velvet Divorce. He underscored how the popular vision of rejoining Western democratic institutions, including the EU and NATO, helped buffer some of Mečiar’s autocratic tendencies and opened the way to successful reform efforts once Mečiar left office in 1998. Prof. James Krapfl then discussed the Slovak transition. He pointed out that most studies of revolutions ignore their most important actors: the citizens, without whom a democratic system of government cannot (by definition) be created. He explained how citizens across Slovakia took myriad concrete steps in 1989 and the early 1990s to create a democratic political culture. He pointed out the social, geographic, and temporal patterns in the revolutionary process, explaining how and why the joyous sense of unity that characterized 1989 gave way to frustration, factionalism, and in some quarters despair—though never to the point of Slovak citizens becoming incapable of concerted action for the sake of the public good. He described how the civil society forged in the Slovak revolution of 1989 has proved remarkably resilient, enabling the country to overcome repeated crises since becoming independent 25 years ago, and setting it apart from its neighbors. 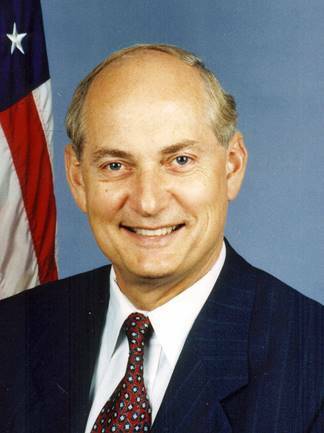 Ambassador Theodore E. Russell (Ret.) served 36 years as a Foreign Service officer, including postings in Prague during the 1968 Prague Spring and Warsaw Pact invasion, and as Deputy Chief of Mission during the Velvet Revolution of 1989. He then served as the first U.S. Ambassador to Slovakia 1993-96. 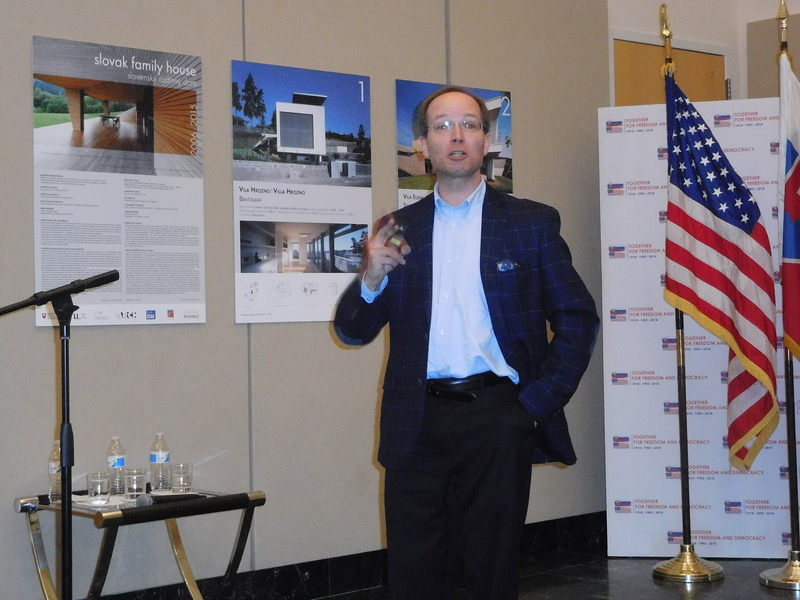 Since 2001, he has served as Founding Chairman of Friends of Slovakia, a non-profit organization of volunteers promoting U.S.-Slovak friendship. Prof. James Krapfl teaches modern central and eastern European history at McGill University in Montreal. He is the author of Revolution with a Human Face: Politics, Culture, and Community in Czechoslovakia, 1989-1992 (Slovak edition 2009, English edition 2013), which won the George Blażyca Prize for the best book of 2013 in East European studies, and the Czechoslovak Studies Association Prize for best book of 2013-14 in Czech and Slovak history. He earned his Ph.D. in 2007 from the University of California, Berkeley, and has conducted research in over 50 local, regional, and national archives in the Slovak and Czech Republics. Ambassador Peter Kmec has dutifully served Slovakia and its citizens for nearly 30 years. 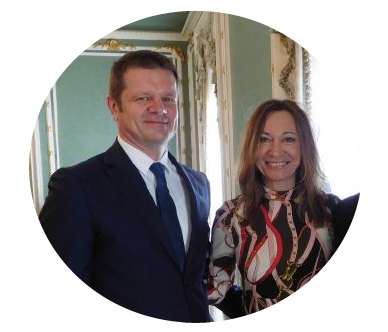 Since September 2012, he served as Ambassador Extraordinary and Plenipotentiary of the Slovak Republic to the United States. 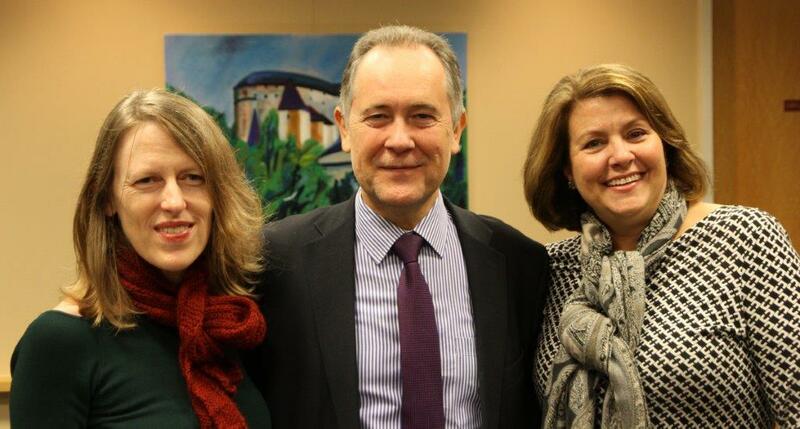 Now, it is time to say farewell and godspeed to Ambassador Kmec and his wife at a reception held in his honor. Click here for a downloadable pdf flyer for this reception event. 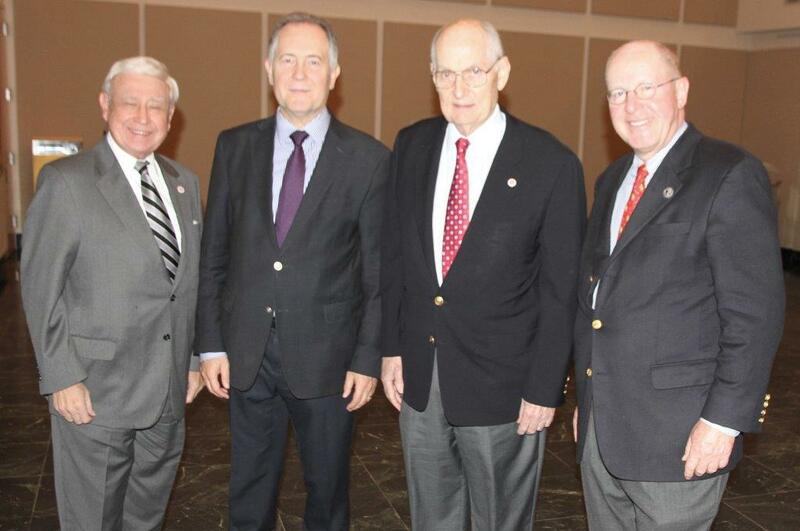 Click here to learn more about Ambassador Kmec’s distinguished foreign service career. The Year 2018 is a special anniversary year for Slovakia, with celebrations commemorating the events of 100, 50 and 25 years ago. The Slovak Embassy kicked off the year’s celebrations with a special reception held in Washington, D.C. on January 19 in the ornate Members’ Room of the Library of Congress on Capitol Hill. The focus of the reception was on the 25th anniversary of Slovakia’s independence, when it split from the former Czechoslovakia in 1993, and its remarkable achievements in terms of integration with Europe and transatlantic institutions, as well as strong bilateral relations with the U.S. under the theme, Together for Freedom and Democracy. At the same time the events that led to the formation of Czechoslovakia in 1918 following WWI were commemorated, along with the spirit of freedom and democracy displayed during the ‘Prague Spring’ of 1968.
behalf of the U.S. State Department by Matthew A. Palmer, Deputy Assistant Secretary of State for European and Eurasian Affairs. 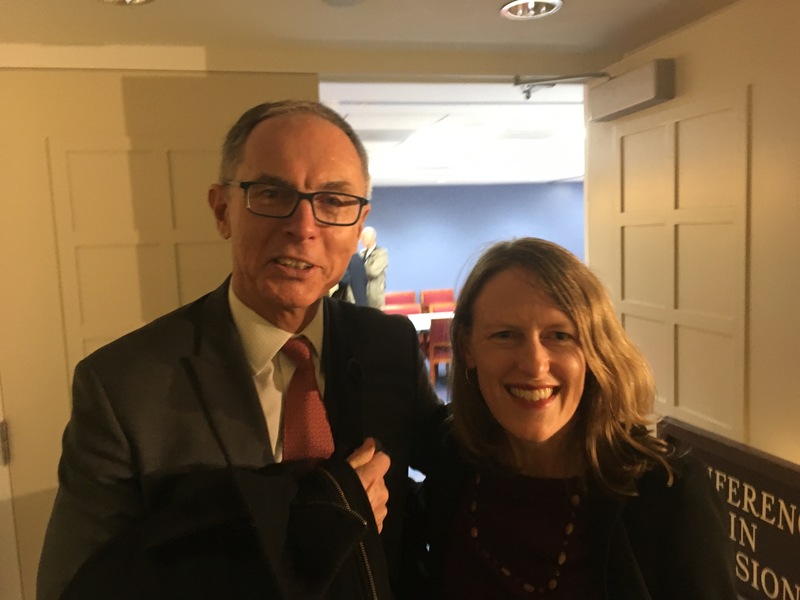 Following the event, the publication Diplomatic Connections (Mar-Apr issue) published an excellent interview with Ambassador Kmec that summarized Slovakia’s achievements in the past 25 years, and also provided some nice photos of the Capitol Hill event. See this link and turn to page 14 for the story. Also, for other events during this anniversary year check the FOS website, www.friendsofslovakia.org or watch for FOS e-blasts. To get on the list for e-blasts and/or to update your contact information send a note to information@friendsofslovakia.org . 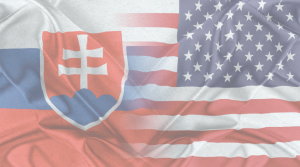 Posted in Events, News	| Tagged ambassador, anniversary, Congressionanl Slovak Congress, Czech, DC, embassy, foreign policy, fraternal, independence, international relations, Matthew Palmer, Peter Kmec, Peter Visclosky, Rod Blum, Slovak, speech, State Dept. 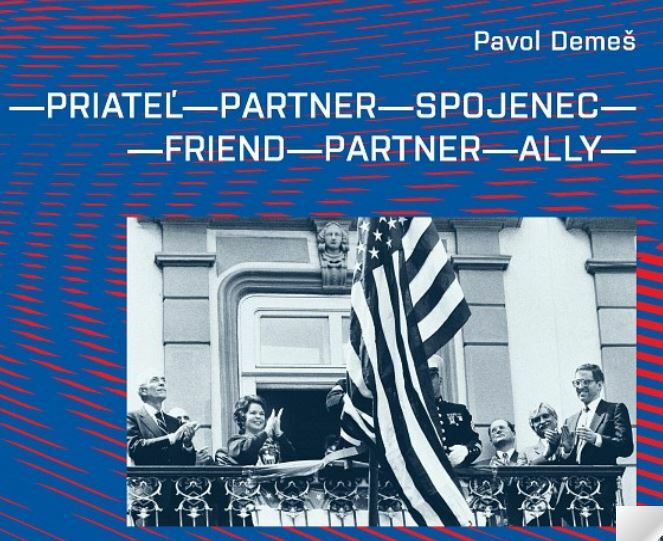 Dr. Pavol Demeš celebrates publication of a revised edition of his excellent book “Friend-Partner-Ally” in a book launch sponsored by Ambassador Adam Sterling at the US Embassy in Bratislava on February 6. 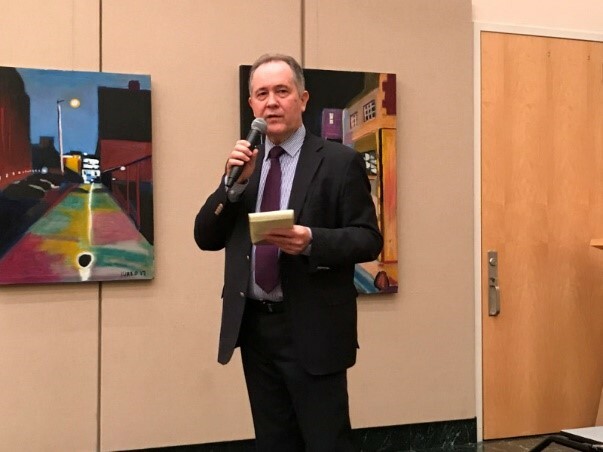 On Monday, November 13, 2017 Pavol Demeš, a well-known Slovak expert on international relations and civil society, author and photographer, spoke about “Slovakia and the United States: The Ties that Bind” at the Embassy of the Slovak Republic in Washington D.C. 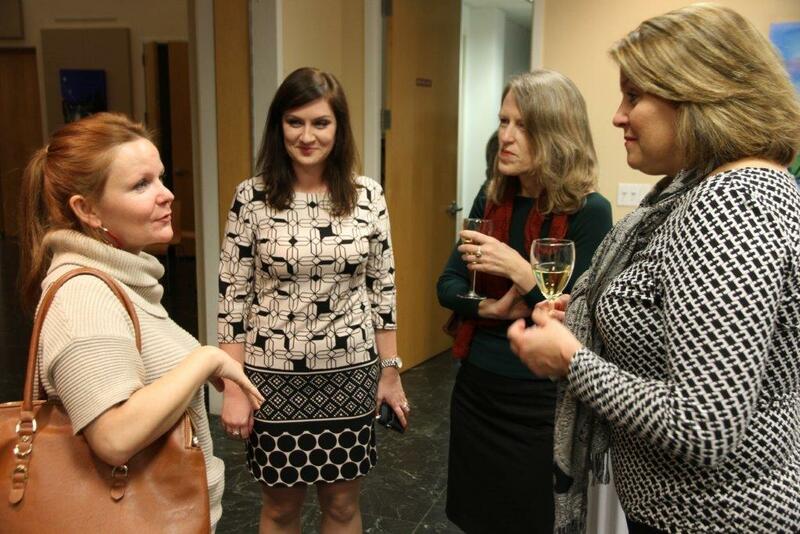 The event was co-sponsored by Friends of Slovakia (FOS) and the Embassy of the Slovak Republic. The evening affair was attended by an inquisitive audience including members of FOS, the Embassy, think tanks and US government agencies. FOS President Joe Senko presented Pavol Demeš with a custom-made General Rastislav Štefánik coffee mug at the conclusion. 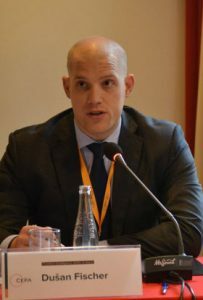 Pavol Demeš’ personal observations included how Slovakia, as a respected member of the European Union and the Visegrád Group, is doing today both domestically and in its foreign relations. He also covered a variety of societal trends and key challenges faced by Slovakia including in the areas of education and the judiciary. Pavol Demeš assessed the current state of Slovak – United States relations in today’s political environment and concluded by positing what could be done to improve these relations via enhanced contacts. 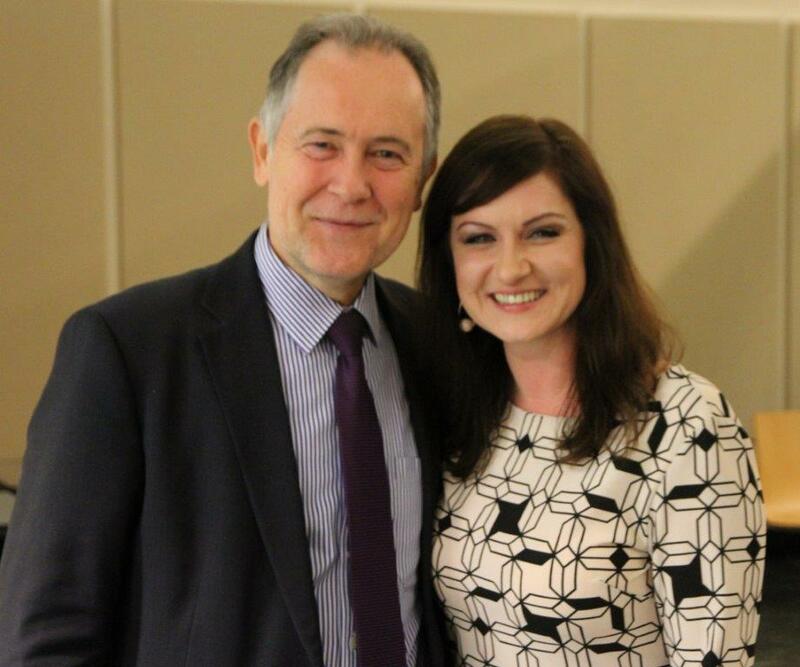 Audience members posed at least a dozen excellent questions to which he provided thoughtful and eloquent responses. The evening ended with a wonderful reception of goulaš and knedle, orechovnik for dessert and, of course, delicious Slovak Wine. About the presenter: Pavol Demeš served in the Slovak government, first at the Ministry of Education and later as Minister of International Relations (1991-92), and then as Foreign Policy Advisor to Slovak President Michal Kováč (1993-97). 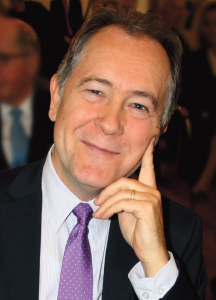 In 1999 he was awarded a six-month public policy research fellowship at the Woodrow Wilson Center in Washington, D.C. From 2000 until 2010 he was the Director for Central and Eastern Europe of the German Marshall Fund of the United States based in Bratislava. Since then, he has been a non-resident Senior Fellow with German Marshall Fund and board member of the European Endowment for Democracy. In 1998 he received the EU-US Democracy and Civil Society Award and in 1999 the USAID Democracy and Governance Award. In 2011 he was awarded a Medal of Honor from the Friends of Slovakia and in 2017 he received the Czech and Slovak Transatlantic Award. 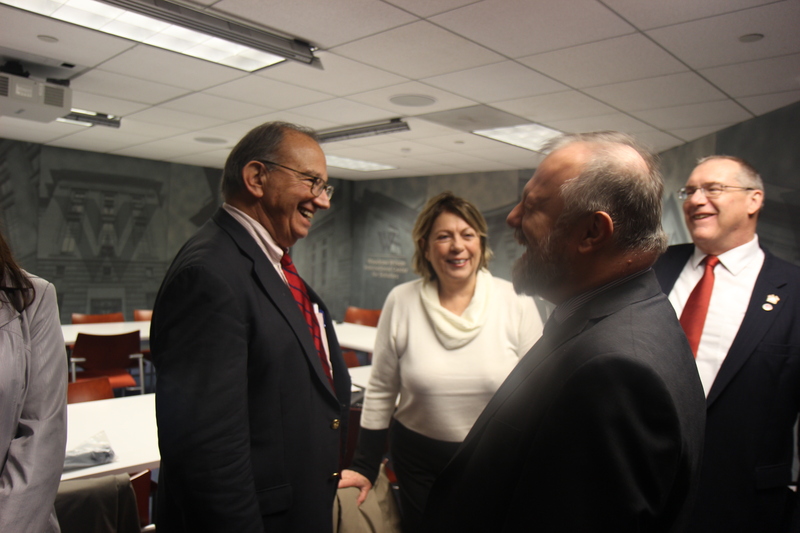 Former Economic Advisor to President Havel, 2008 candidate for President of the Czech Republic and Professor of Global Political Economy at Columbia University Jan Svejnar gave the 2017 Czech and Slovak Freedom Lecture at the Wilson Center on November 7. 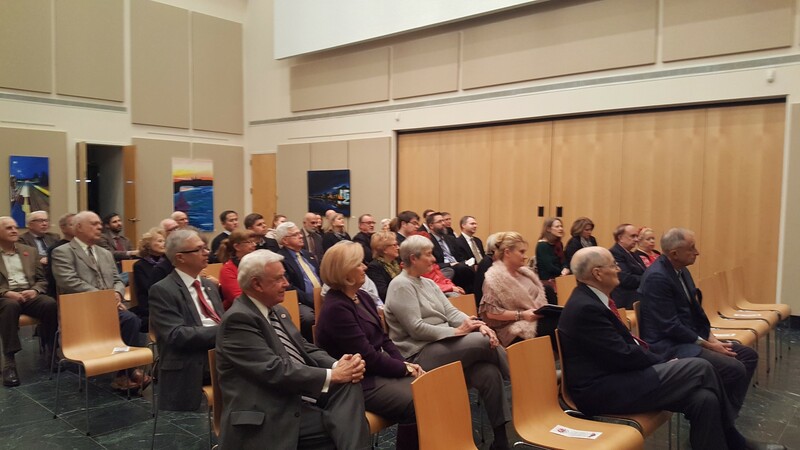 Friends of Slovakia co-sponsored the lecture with The American Friends of the Czech Republic and the Czech and Slovak Embassies. It was attended by a lively audience including members of FOS and AfoCR, the press, think tanks and US government agencies. 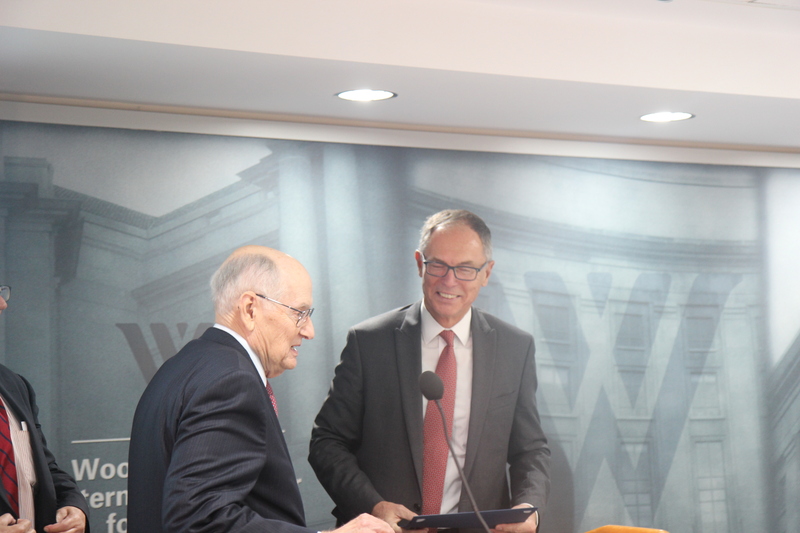 FOS Founding Chairman Ted Russell presented Professor Svejnar with the FOS Medal of Honor for his work promoting democracy, a free market economy and an active role for the Visegrad countries in the European Union. The lecture was recorded and may be heard via the link listed below. The first few minutes recorded on the link are low volume, but normal volume is resumed if you scroll in 7-8 minutes. 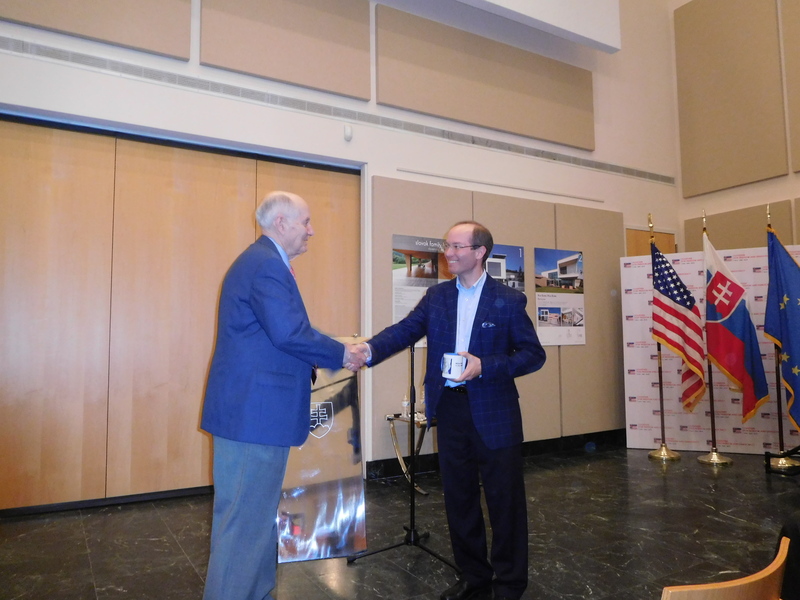 FOS Founding Chairman Ted Russell presented Professor Svejnar with the FOS Medal of Honor. Pavol Demeš is a well-known Slovak expert on international relations and civil society, author and photographer. He served in the Slovak government, first at the Ministry of Education and later as Minister of International Relations (1991-92), and then as Foreign Policy Advisor to the President of the Slovak Republic (1993-97). In 1999 he was awarded a six-month public policy research fellowship at the Woodrow Wilson Center in Washington, D.C. From 2000 until 2010 he was the Director for Central and Eastern Europe of the German Marshall Fund of the United States based in Bratislava. Since then, he has been a non-resident senior fellow with GMF US and board member of the European Endowment for Democracy. In 2011 he was awarded a Medal of Honor from the Friends of Slovakia and in 2017 the Czech and Slovak Transatlantic Award. Click here to view a downloadable pdf invitation. Click here to view the event on Facebook and share with your friends. 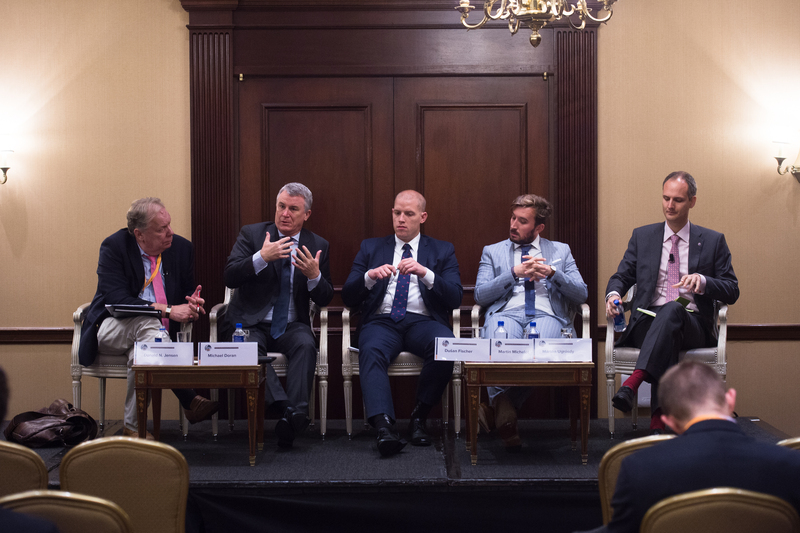 The annual transatlantic security conference organized by the Center for European Policy Analysis (CEPA) has become the leading event in Washington D.C. focused on issues in Central and Eastern Europe. 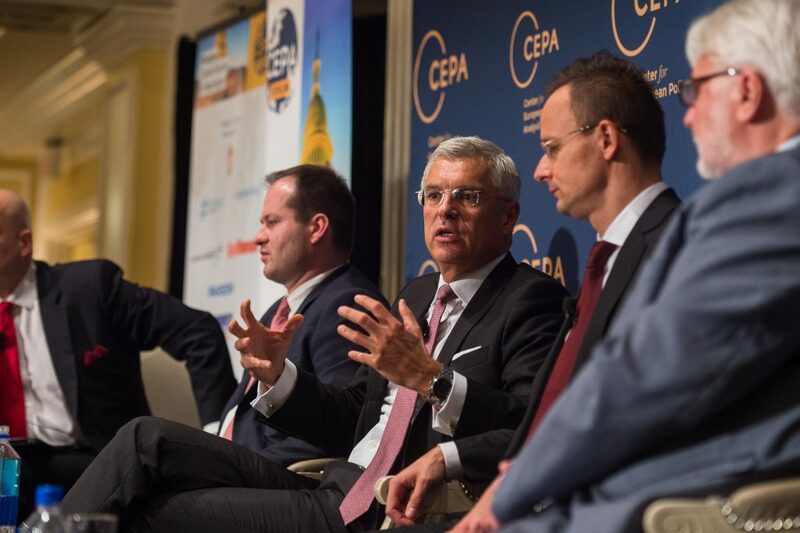 The theme of this year’s CEPA Forum 2017 was “Preserving Atlanticism in a Time of Change,” and was held on September 21-22 in Washington, D.C. The Forum was organized by CEPA in cooperation with the Embassy of Hungary and together with a number of corporate and non-profit supporters, including the Visegrad Fund, Friends of Slovakia (FOS) and American Friends of the Czech Republic. FOS has provided support to the Forum for the past several years. 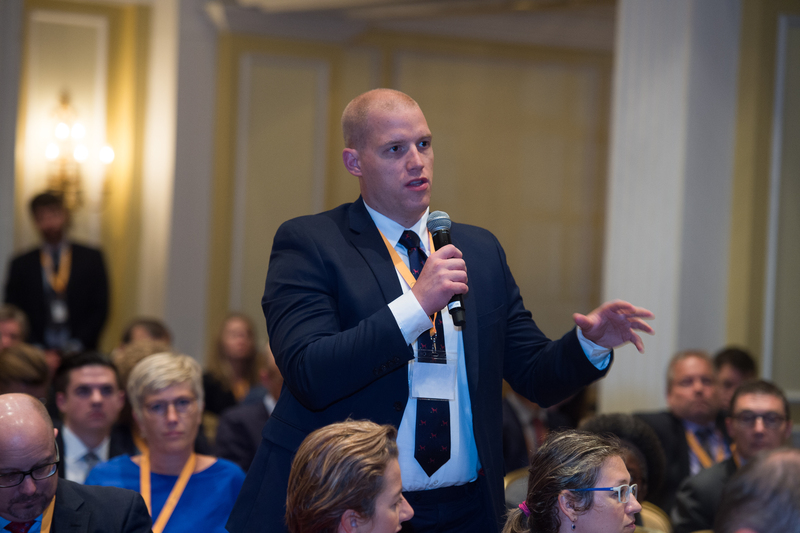 This year, Ivan Korcok, Slovak State Secretary of the Ministry of Foreign and European Affairs, and Dusan Fischer, Researcher with the Slovak Foreign Policy Assn., were featured speakers. 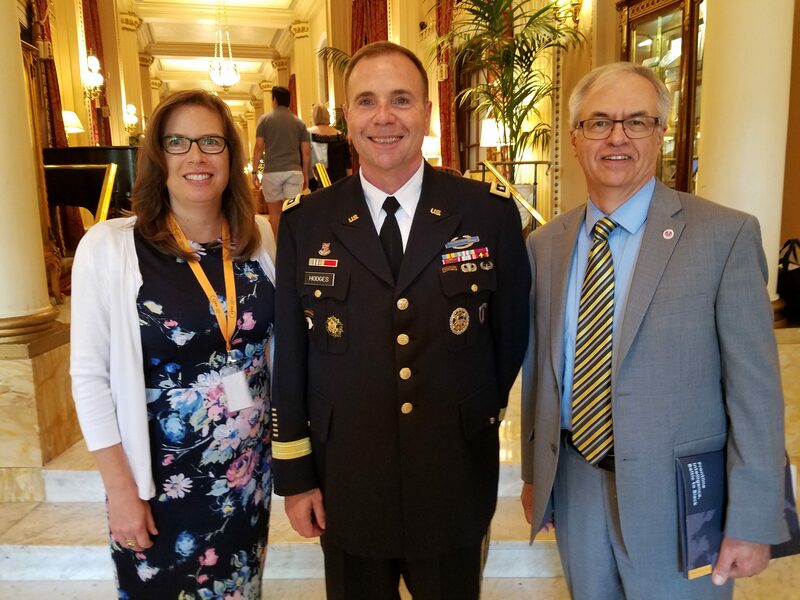 Lt. General Ben Hodges, Commander, U.S. Army Europe (center) at the CEPA Forum, with (left) Karin Shuey, Washington, DC Director of the Estonian American National Council and (right) Ken Bombara, Vice Chairman, Friends of Slovakia.